:To the people of Judah, distressed by changing political realities, it seemed that God had lost control of the situation-if he'd ever had it in the first place. Zephaniah warned of imminent judgment but also pointed to hope close at hand: God is both Judge and a Refuge from judgment.In Haggai's day, God's struggling people needed to reorder their priorities and invest themselves in building the Lord's house. Haggai declared that God's renewed presence in their midst would bring renewed blessing.When doubt of the Lord's love and watchfulness led the people into sin and distress, Malachi addressed their concerns and failings one by one. God would not abandon those who feared him, despite a history of rebellion against him.Practical, devotional, and expositional, this commentary delves into the ways these three prophets point us to the sufferings of Christ, the forgiveness of God, and anticipated glories to come. 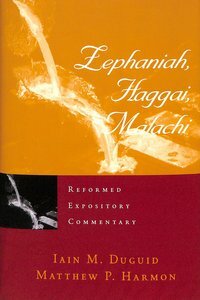 About "Zephaniah, Haggai, Malachi (Reformed Expository Commentary Series)"